Contemporary Sunset Cliffs Beach Cottage is set in San Diego 4.1 km from SeaWorld San Diego 6 km from Old Town San Diego State Historic Park and 7 km from University of San Diego. Guests have a private patio. The holiday home comes with 2 bedrooms a flat-screen TV and a fully equipped kitchen that provides guests with a dishwasher. Downtown San Diego is 9 km from the holiday home. 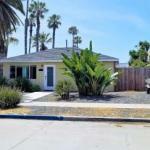 The nearest airport is San Diego International Airport 5 km from Contemporary Sunset Cliffs Beach Cottage.